The Queen of the Night glistened in the dark. It was late, past my bedtime. But she was so beautiful. Magnificent. People pointed and smiled, milling around her with flashlights. “The cactus is blooming.” That was the message on my cell phone. What? Why would I care about some cactus, I’d wondered. Then I learned: Epiphyllum Oxypetalum. They bloom rarely, and only at night. And by the first light of day the flower would wilt and die. The plant had only a few blossoms. In the dark, I photographed it up and down. I would immortalize it, post it on Facebook and Twitter, print it up BIG on premium archival paper, adhere it onto gatorboard with a polycarbonate laminate finish and polished German silver frame. This was my new way of memorializing things. My old Omi Rosie used to tell me to take pictures in my mind if there was something beautiful or special I wanted to remember. No camera. Just in my head. So over the years I gathered “snapshots” in my head…. Like my first real kiss, on a summer night, the guy had a full set of braces that cut into my lips making them swell as we sat under stars, on a dock that rocked over a fishy-smelling black lake that lapped loudly…. And later, newly arrived at college, walking on the quad over fallen ginkgo leaves, yellow and stinking like dog-poo, my arms ached weighted down with just-bought textbooks and I told myself to remember this beginning of the adventure that was my own, not my family’s…. Later still, my newborn son’s eyes that could turn into any color…. “Snapshots” in my mind. That always worked for me. Because most of my life I hated cameras. “They keep me away from what’s going on. Why would I want to put a box between myself and what I want to remember?” I’d say. That was before my daughter died. The daughter who loved photos. The night I visited the Queen of the Night I couldn’t sleep. I drove back, through thick fog early the next morning before sunrise, to see the plant once more. And I thought of the other beautiful, short life I’d witnessed at its end. Five years ago. On the morning I knew would be my daughter’s last day, I filled my eyes with her face, to plant a “snapshot” in my head, to always remember. And that image, indelible in my mind, is infinitely more breathtaking than this photograph I took of the Queen of the Night in her last glory, just as the sun came up. What do you do to always remember something beautiful, important, loved? Do photographs work for you? Or do memories? This entry was posted in 2016 and tagged celebrating life, life is short, memorable moments, memorial photography, nightblooming cactus, photographs and memories, pictures in my mind, queen of the night, snapshots on 2016/09/12 by Robin Botie. 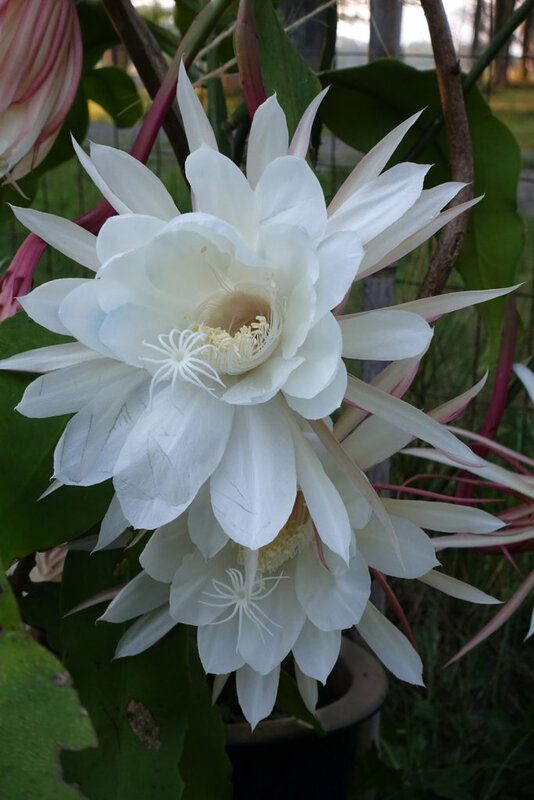 The Queen of the Night blooming is a peak experience, that most of us will never have. One of the artists at the museum where I work, Alhed Larsen, held an all-night party once so she and all the guests could witness this miracle. The flower finally bloomed at 4 AM and was immortalized in pastel and on film. That is one of those things you HAVE to photograph. But I agree that a camera can get in the way of fully experiencing a special moment, like sunset with murmurations of starlings or other birds. They are part of a sensory package that can’t be limited to the visual realm. Just like your examples that include a full range of senses, with your newborn son or with Marika about to die, a camera can’t begin to record the moment. Yet, as an illustration for your moving essay about how to experience life’s best and worse episodes, your photo of the Night-blooming Cereus is stunning and powerful. Thank you, Robin, for a beautiful photograph and a beautiful memory of your daughter. Thank YOU, Lynne. It means a lot to me to have you out there and keeping up with me. So beautiful, Robin. Your post and of course the flower, tool. Marika was infinitely more breath-taking. I know. Even in her dying. People who haven’t witnessed death protest when I say that, but it’s often true. Vic’s face was serene and beautiful in his dying and even after his death. And he smelled so good and so much like the earth. I didn’t expect that. I’ve seen these plants bloom once and they are spectacular and so is the fragrance. Thank you for the gifts of your beautiful images and reflections. “I filled my eyes with her face”. This brought me to tears. Thank you for sharing your tender reflections Robin. Cheers, Monica. I could say more about how I watched my daughter’s face, knowing I wouldn’t be able to see it again, but I know you have work to do on Lena’s book, and you don’t need to be brought to tears today on my account. But I am wondering how the book is going. Must check to see if there’s more news as the last I heard from your blog, you were trying to pull together Lena’s author-bio. Another winner! Beautiful, heartwarming, memorable.